After trying and failing yet again to get last minute reservations to Tickets, my girlfriend and I decided to visit Espai Kru. 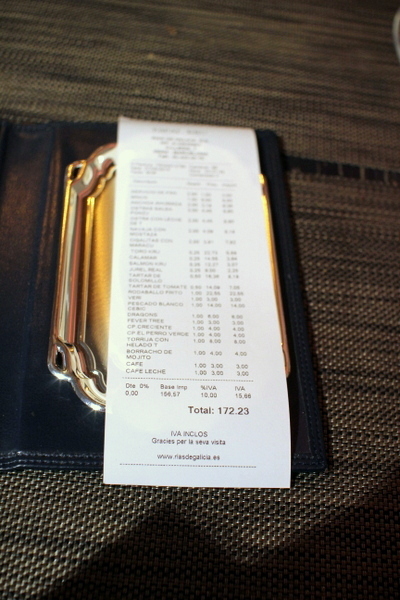 The contemporary seafood restaurant is run by the Iglesias brothers and partners to the Adrias at Tickets and 41°. The Iglesias brothers are second generation restaurateurs and still run Rias de Galicia a classic seafood restaurant started by their parents in 1986. Unlike its more classical sibling, Espai Kru shows the modernist influences of the Adrias. The menu emphasizes raw meats and vegetables; celebrating food as our ancestors ate it prior to the discovery of fire. The decor further emphasizes the cosmopolitan feel with sleek minimalist furniture and a slate grey bar/open kitchen. 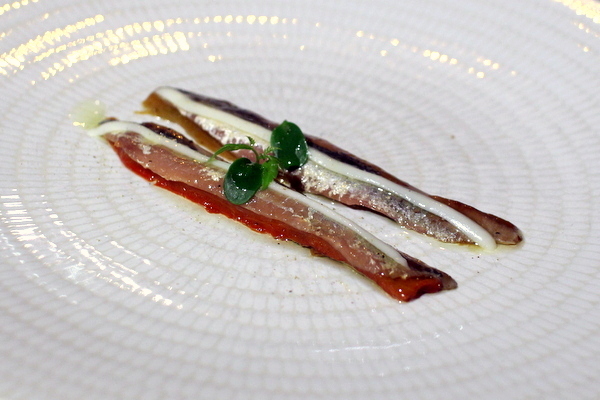 The meal kicked off with a punchy smoked anchovy. The whispery sliver of fish is saturated with oil and wood smoke coupled with a cheesy twang from the manchego cream. The fleshy red pepper provides a cool vegetal counterpoint to the aggressive smoked fish. 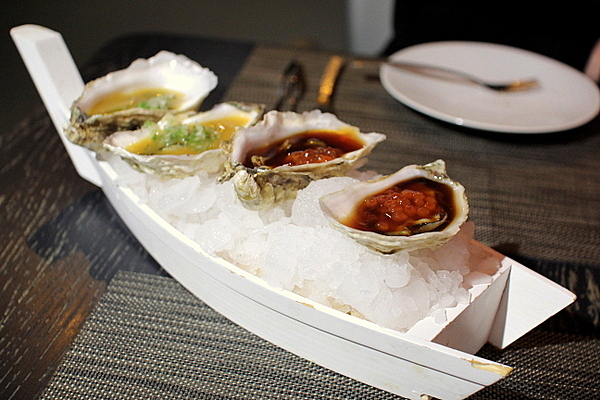 The next dish had a cosmopolitan flair, pairing sweet meaty oysters with Japanese and Peruvian flavors. 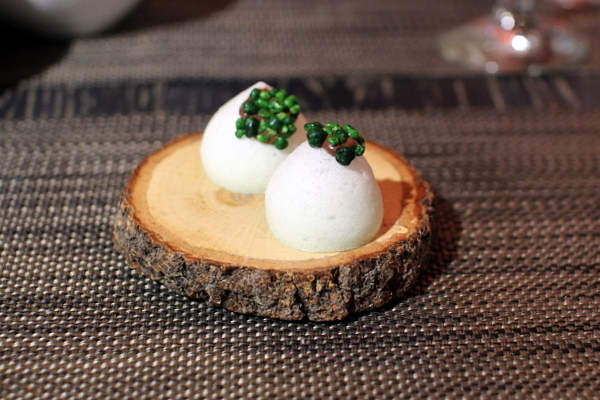 The ponzu and salmon roe were a natural pairing moderating the oyster's intrinsic salinity. 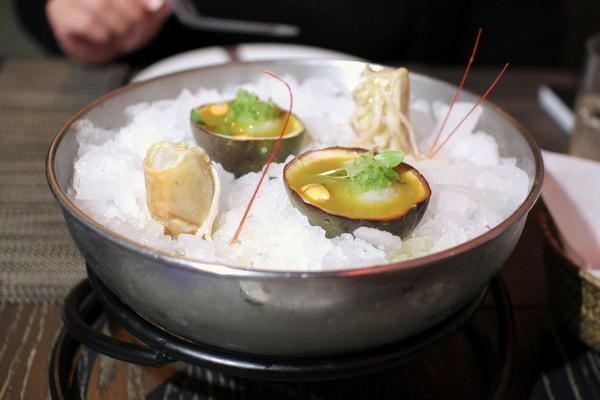 I was a bit concerned that the leche de tigre would be too harsh for the oyster and while there was a serious acidic heat, there was also a touch of citrus and freshness that worked nicely with the bivalve. 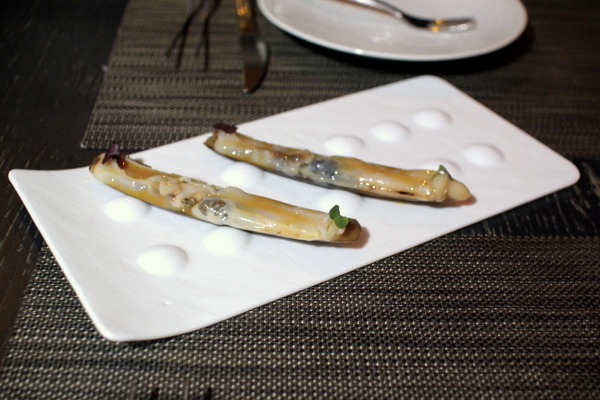 The razor clams were fresh and snappy, but their subtle saline was overpowered by the earthy twang of the mustard. I loved the presentation of this course. Tossing back the cup in one quick gulp, the dish opened with the intensity of the aguachile up front but finished with a cool creamy salinity from the prawn with a touch of toasty almond thrown in for good measure. 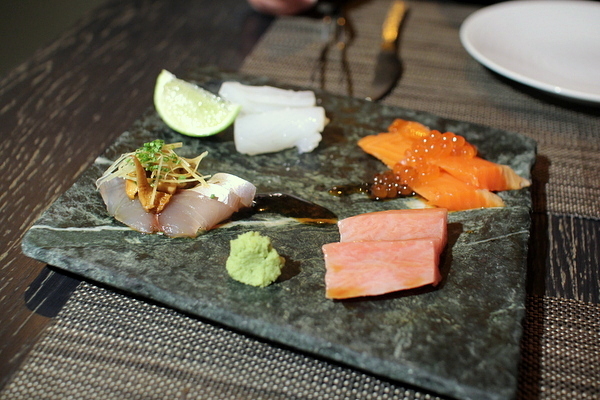 Moving onto the sashimi course we were presented with a quartet of beautiful seafood. First up was a pristine slab of tender squid served topped with a bit of salt and a side of biting lime juice. The mackerel had a nice aromatic sear and a savory topping of fried garlic and spicy ginger to contrast the weighty fish oil. The salmon was the least interesting of the quartet, fresh fish and salty-sweet roe were enjoyable but forgettable. 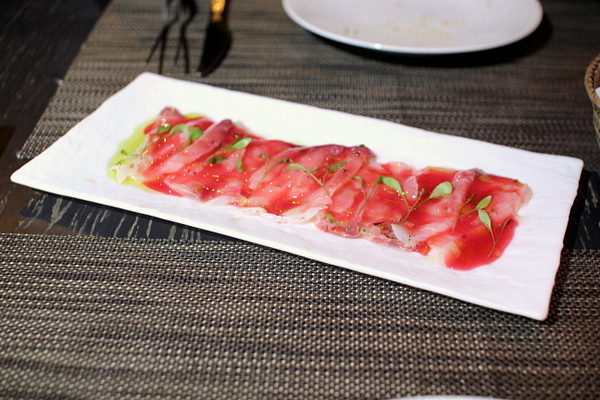 The last fish was a local toro the pink-white flesh was a tender morsel of oleaginous joy. The seasonal whitefish was a snapper ceviche. The fish exhibited a complex multifaceted texture that was snappy on the edges and fleshy towards the center. The sauce had a classic acidity complimented by bright sweet berry fruit. 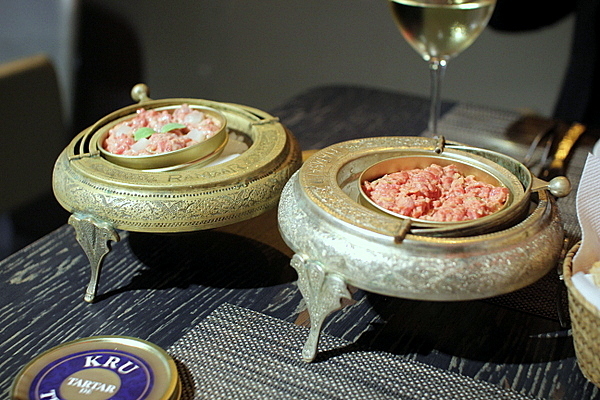 Next up we were served a duet of tartare served in antique ornate caviar dishes. first up was a classic beef tartar fine cubes of tender raw meat seasoned with creamy tangy mustard. When presenting the course, our server declined to describe the second tartare and seemed surprised when we correctly identified it as tomato. According to our waiter, most people identify the mystery tartare as fish which seems hard to believe as it tastes like a sweet pico de gallo. The final savory of the evening was a whole fried turbot served with ras al hanout and miso mayo. 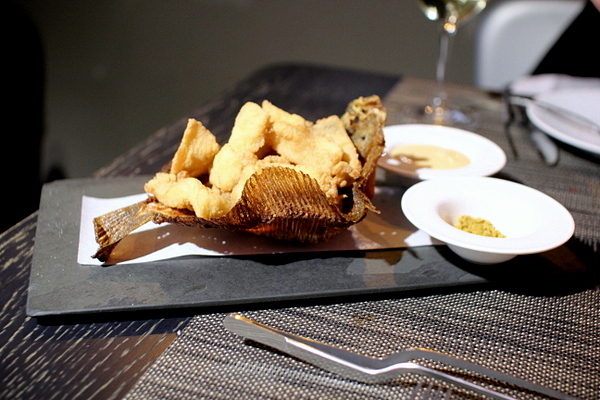 After a chorus of raw dishes the fried fish was a heavy contrast. Flaky and tender the fish was enjoyable but the basketful of fish grew rather monotonous after awhile. I found this dish a bit out of place given the emphasis on raw food. To be fair the final page of the menu focuses on dishes after the discovery of fire, but I think more straightforward grilled fare would have fit better. The only real miss of the night, the first dessert was a double whammy of booze. 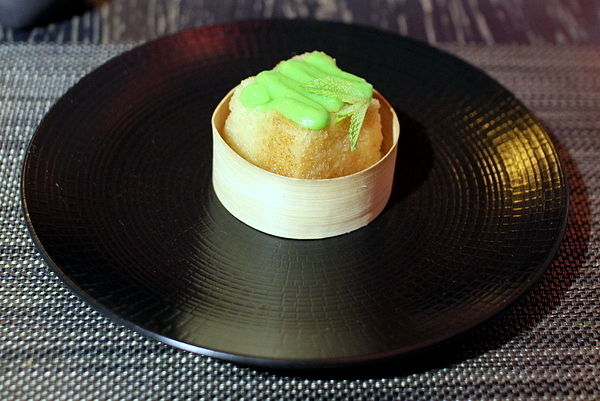 The cake is little more than a sponge soaked with alcohol and astringency and finished with a twinge of mint. 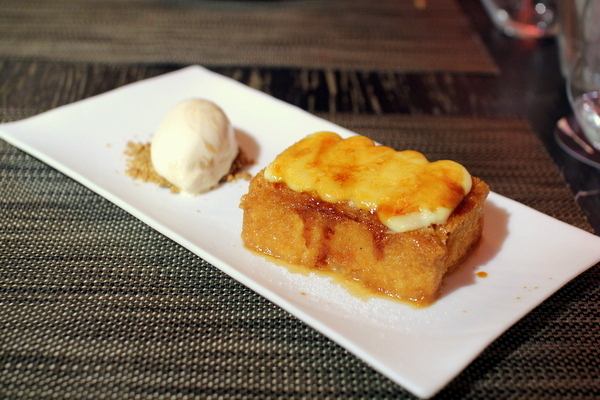 The second dessert was one of the best preparations of French toast that I've ever had. The fluffy egg infused toast comes topped with a bruleed crust and the nougat ice cram provided a cool creamy contrast to the sugary treat. Our final sweet of the night was a classic pairing of mint and chocolate served as an airy spun sugar confection laced with pop rocks.